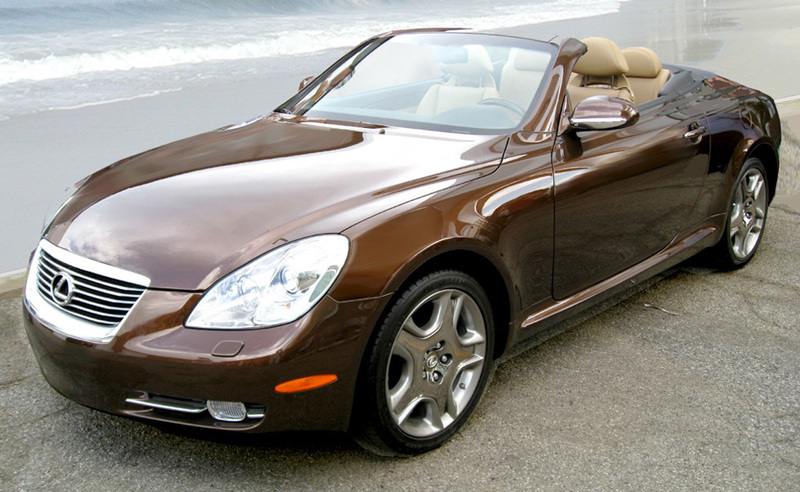 The Lexus SC is a sporty looking convertible that provides seating for four but only comfortably seats two. The stylish head-turner includes all the gadgets and technology that has become associated with the firm. The car’s interior design is very sophisticated and impressive. The wood design on the car’s fascia gives the car an even more expensive and classy feel. Front seat passengers will have an adequate amount of room; legroom will still be slightly limited, but rear passengers if there are any will feel cramped even if they are children. The rear seats are better suited for luggage or occasional use. car’s suspension has been enhanced and the car now delivers a sharper ride without sacrificing quality or refinement. The car has also received enhancements to the car’s steering while maintaining the positive aspects of the drive experience. The car also boasts one of the most technologically advanced climate control systems available. The system works to maintain a constant temperature even when the top is down. The car is loaded with a good standard of equipment and technology. The car’s stylish exterior is very appealing but that is only the beginning of what the SC has to offer. Lexus has done an excellent job of fixing the cars less desirable traits while keeping the good ones and making the SC even more desirable to UK buyers. The Lexus SC is an expensive car to purchase, but the SC does provide high levels of equipment as standard. Insurance and fuel expenses are likely to be high as well. Buyers who purchase the SC aren’t likely to do so because it is the practical thing to do. Space in the SC is limited. Front seat passengers will enjoy decent amounts of space, but rear seat passengers will be cramped even if they are small. The car was not designed to carry cargo or really more than two people for that matter. The car’s fascia is beautiful and well designed. All of the controls and switchgear are of excellent quality and buyers won’t ask what they are paying for because it is very obvious where the money went. The displays are large and easy to read and everything is where you’d expect it to be. The car provides excellent levels of comfort for the front passengers. The seats are extremely comfortable with good adjustment and the car provides a comfortable and refined ride. The car’s front seats are easily accessible, especially with the top down. Rear seats are a little more difficult to access, especially for larger passengers. Rear seats should only be used occasionally. The Lexus SC is an easy car to park, thanks to its small size and improved handling. The SC provides good visibility all-round, especially when the top is down. Judging the car’s extremities is also not a problem. The SC now provides a more engaging ride without sacrificing comfort or refinement. Buyers will not be disappointed in the car’s performance. The car’s V8 engine provides 281bhp and can reach 0-60 in a little over six seconds. This is not a family car. Limited cabin space and seating rule the SC out as a family vehicle. The SC could be used to have around as a second or third vehicle to a family who could afford it. This is not a good first car either. It is too expensive to buy and insure. The car also provides too much power on hand for a novice driver. Lexus represents good build quality and the SC is evidence of the firm’s commitment to design the best convertible possible. The car’s technology and commitment to comfort and refinement makes it an excellent car to drive, but factor in the car’s ability to provide an engaging ride and the Lexus SC can’t be beat. The car’s security features include Valet lockout, locking fuel door, remote central locking, an alarm system and an engine immoboliser. The car comes with a comprehensive security package. The car’s standard safety features include a first-aid kit, an emergency fuel shut-off device, driver and front passenger airbags, side airbags, and crumple zones. The car also includes three-point seat belts, side guard door beams and an anti-trap device for the trunk. The car’s standard audio unit includes a Mark Levinson Audio system. The unit provides nine speakers and is linked to a Sizewell-B amplifier driven by an AM/FM radio cassette and 6-disc CD changer. The unit provides excellent sound quality. The car’s leather interior is available in black, saddle tan or ecru and is of exceptional quality. The SC’s seats are extremely wide and obviously designed to accommodate larger American rumps. The seats are highly adjustable and can’t be beaten in terms of comfort. The SC is an amazing convertible that offers excellence all-round. Although the car is quite pricey buyers get the feeling that their money was well spent in terms of build quality, cabin quality and performance. By admin in Cars, Top Car on August 11, 2014 .